Posted on June 22, 2017 by Megan V.
TMI fans, here is the next book in the installment! Emma is struggling with her love for Julian, and so, unknown to him, has begun a fake relationship with Mark. Mark himself is struggling whether to love his past, Kiernan, or his future, Christina. Christina is struggling with Diego and Mark. Diana finds a love interest of her own. Kit “Herondale” is struggling with his new name and the legacy of it, while also finding some new friends with the twins. We also see some TMI characters like what we saw with Lady Midnight– Clary is unsure of whether to marry Jace or not, and Alec and Magnus play a big role in helping Julian, Emma, and the gang with issues such as the concern of Downworlders with the Clave. The Clave itself is being as stupid as always, as there are many Downworlder haters there. Oh, and did I mention that we haven’t seen the last of Malcolm? Of course, Cassandra Clare still works her comedy within the story, as shown when Ty is amazed that Kit knew about Sherlock Holmes and John Watson, even though Kit laughs at how did no one in the Shadowhunters knew who they were. Additionally, there are, of course, secrets providing twists and turns to the plot, especially when the Blackthorn family finds out a secret of Julian’s. However, despite all of the positives and the things I was happy with in the sequel, I was quite disappointed with a few things. First of all, Magnus and Alec appear a little too much in the book, making the spotlight go to them instead of the Blackthorns. Secondly, one can’t read the book without reading the TMI series. Robert Lightwood references what happened with Michael Wayland, making the context only relevant if one read what happened to him back in The Mortal Instruments. Additionally, the issue of Malec, one making immortal and the other not, is referenced too, making it necessary to read The City of Heavenly Fire. It is also required to have read The Infernal Devices. Kit is asked whether he is going to be a Jace, Will, Stephen, or a Tobias, requiring the necessary background information in order to understand. Additionally, we meet a ghost named Jessamine Lovelace, and if one hasn’t read The Infernal Devices, one does not know what she is all about. However, despite all of these negatives, it is quite an enjoyable book, one worth reading. Lord of Shadows by Cassandra Clare is available for checkout from the Mission Viejo Library. It is also available for download from Overdrive. Posted on April 1, 2014 by Kaelyn L.
Paranormal romance novels seem to be all the rage in the teenage reading world right now and, in this case, I am no exception to the norm. I mean, seriously, what isn’t awesome about paranormal romance? You get adventure, action, romance, fantasy, mystery, mythology, realistic fiction; pretty much all of the genres rolled into one! Some series of this genre that have joined my ever-growing bookshelf are Born at Midnight (Shadow Falls series) by C.C. Hunter, Vampire Academy by Richelle Mead, and City of Bones (Mortal Instruments series) by Cassandra Clare. All of these series are, as I like to refer to it, realistic fantasy. Born at Midnight is the first novel in the Shadow Falls series. If you can look past all of the grammatical and spelling errors, (and there are A LOT – she should seriously fire her editor) this series is a gem. You’ll love the characters from the start and there definitely is a Team Edward, Team Jacob situation going on. In this case, Team Lucas, Team Derek is the ongoing debate. I consider these books to be a mix between The Lightning Thief by Rick Riordan due to the supernatural camp setting and Twilight by Stephanie Meyer because of the romance triangle and similar paranormal creatures. If you enjoyed either of these books or any of the books listed above, I am betting you will appreciate this series. Vampires. These supernatural beasts seem to be filling the shelves and theaters everywhere. From Twilight to Marked to Vampire Academy, vampires are everywhere. 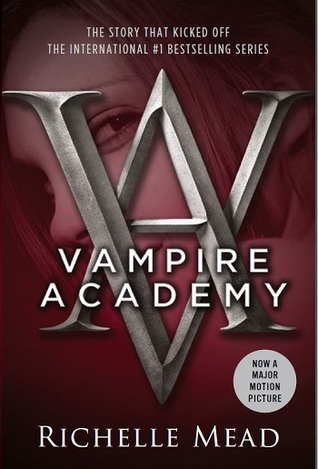 Vampire Academy is the first in a series of six novels, all centering around Rose Hathaway, a Dhampir who is training to be her Moroi best friend’s bodyguard. Dhampirs are half-vampire, half-human and walk the earth for one purpose; to protect the Moroi royalty from Strigoi and other evils. Moroi are full vampires who are living. Each Moroi develops their own form of an elemental magic while in their teens, with a few exceptions. Strigoi are the evil form of vampires. Dead, inhuman, impossible to kill, and willing to kill to survive, these vamps are made when a Strigoi drinks blood from a human, Dhampir, or Moroi and the human, Dhampir, or Moroi, in turn, drinks Strigoi blood. A Moroi can also turn by choice if he or she kills a victim while drinking their blood. These books take place at St. Vladimir’s Academy, a school for training young Moroi and their Dhampir counterparts. The Mortal Instruments series is one of my absolute favorites. I have read all of the books four times and am psyched that they are making a movie out of it (though I’m not so sure about Lily Collins as Clary. I mean, COME ON, she is supposed to have flaming read hair! Not black). 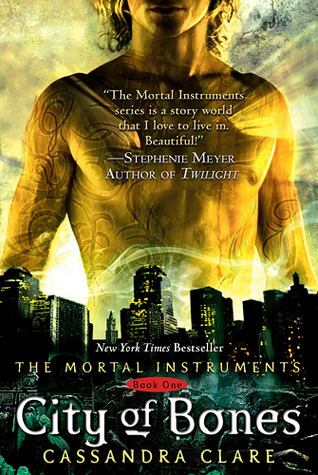 The first book takes place in New York and at the Institute, an old, dilapidated church that was converted, to the oblivion of the mundanes (humans), to a Shadowhunter stomping ground. Shadowhunters, also called Nephilim, are half-human, half-angel and are, like their name hints at, demon hunters. They still bleed and die like humans, so they use a stele to draw runes on their bodies. Runes are markings, some temporary, some permanent, that are somewhat similar to tattoos and give powers based off of the rune that was drawn. This series centers around Clary Fray who was hidden from the Shadowhunter world by her mother and, until she has to get her mother back, knows nothing about supernatural creatures or demons. When her mother disappears and she is attacked by a Ravener demon, Clary is thrust into the world of the Nephilium where she finds she should have been all along. With the help of Jace Wayland, Isabella and Alec Lightwood, and Simon Lewis, she begins to study the Shadowhunter ways and searches for her mother, all while encountering what her life could have been like, as well as some romance along the way. Posted on November 4, 2013 by Meagan R.
Have you seen “The Mortal Instruments: City Of Bones?” Well, the movie is based on a saga of six books. 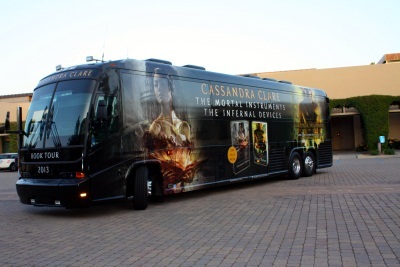 These books and soon-to-be movies, are written by a famous author named Cassandra Clare. 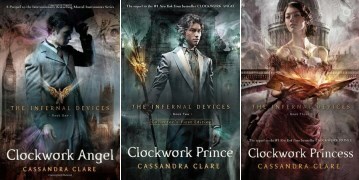 She has also another series called The Infernal Devices. They both are based in a world within our own. There are half human, half angel people named Shadow hunters, there are also Warlocks which are magical beings like wizards. They also have demons, vampires, werewolves, and a whole bunch of other creatures. City Of Bones is about a young girl, Clarissa Fray, who collides into this other world. Clarissa, otherwise known as Clary, meets up with her friend Simon to go to a club named The Pandemonium Club, in New York, and she witnesses something no ordinary human would see. She saw three people- or she thinks are people- kill a boy or rather, a demon with strange weapons. She thought she was having a mental breakdown, because nobody else can see them. When she sees one of the three people, she questions why she can see him and nobody else can. He tells her that he is a shadow hunter: half human, half angel. He was made to get rid of the demons that are coming into Earth. Clary goes home and her mother has disappeared and the house is destroyed. Clary has to team up with a group of shadow hunters to find and get her mother back at all costs. The books are truly amazing and well thought out. I highly recommend this series! Posted on October 2, 2013 by Sara S.
The Infernal Devices is a series written by the well known and loved author Cassandra Clare. A sister to The Mortal Instruments series, The Infernal Devices captures the lives of the ancestors of the characters we know and love. This series is about a young woman named Tessa Gray, a New Yorker who moved to England to meet her brother. Tessa is on a mission to find her true identity, and find the truth about the life she lived before coming to England. Tessa also falls into a love triangle in which she must choose between the overconfident yet charming Will Herondale, or the sweet and caring Jem Carstairs. The reader takes an adventure through Tessa’s Victorian England and falls in love with each and every one of the characters. Through clockwork angels and partying with demons, the books contain adventures in every chapter. Not to mention that we get to see what the well known Magnus Bane (from The Mortal Instruments) was like when he was still hanging with the Lightwoods before Alec and Isabelle. Overall, I would definitely say this is my favorite book series I have ever read, and Cassandra Clare never fails to please her fans with her spectacular writing. 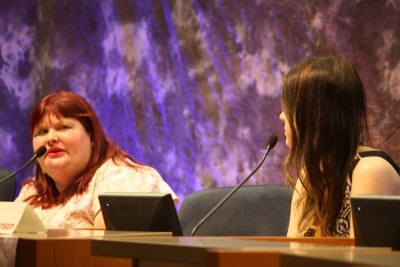 Posted on May 16, 2013 by Mariah W.
In March, authors Cassandra Clare, Sarah Rees Brennan, and Maureen Johnson made a stop at the Mission Viejo Library for Clare’s latest release, Clockwork Princess. I was extremely thrilled to meet all of them, and the feeling was definitely echoed throughout the room. As we waited for the authors to arrive (they got caught up in LA traffic), we watched the book and the movie trailer, and in two contests, fans competed for posters of, Will and Jem, popular characters from Clare’s books. 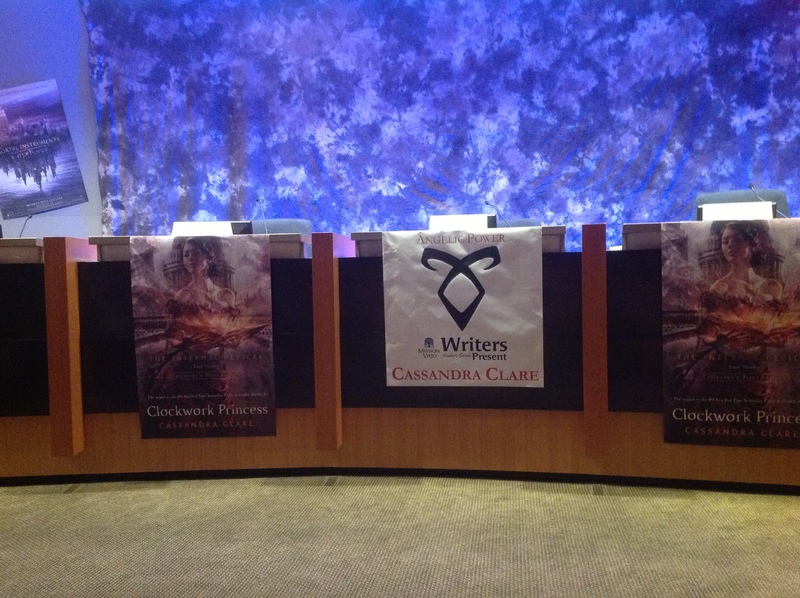 Once the authors arrived, they jumped right into answering our questions about their books and the upcoming City of Bones film. 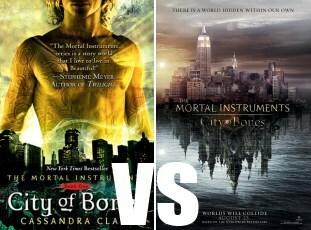 Cassandra Clare, where did you get the inspiration for your books? She got the idea of Shadowhunter from one of her friends who was a tattoo artist and talked to her about the history about tattoos. They were believed to give people strength in battle and during journeys, and Clare thought that it would be cool if there was a race of people for whom these tattoos would actually work. What characters are the three of you most like? After thinking the question over for a moment, they agreed that Sarah is like Magnus Bane because of her fiery personality, Maureen is the most similar to Alec, and Cassie was compared to Jace because of her ability to “have a little faith” like he does in times of trouble. Who do you like more: Tessa or Clary? She couldn’t decide between the two. Tessa is more like her, but she admires Clary for her bravery and recklessness. Clare responded by saying that she likes to take the hearts of her readers and put it in a cocktail glass and make a heartini. How much involvement do you, Cassie, have in the film adaptation? She has had a good amount of input into the film. She answered questions that the production team had, and she had a heavy involvement in the casting process. Once the Q&A session was complete, we were able to get our books signed! Overall, the event was one of the best signing that I’ve attended. All three of the authors were incredibly funny and kept me laughing the entire night. They joked about the ways they toy with our emotions and all of the wonderful boys in the Infernal Devices and Mortal Instruments series. It was an honor to meet all three of the authors, and I want to thank them for visiting Mission Viejo.